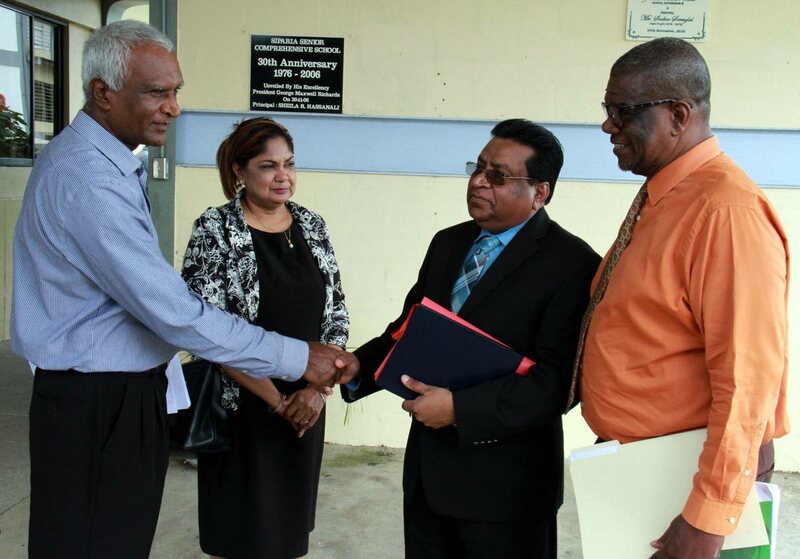 At left, Siparia West Secondary School principal Sookoo Sonnylal greets at center, Chief Education Officer Harrilal Seecharan while second left, School Supervisor III Zabeedah Hosein - Abid and at right, Act Director of School Supervision John Thompson looks on. PHOTO BY ANIL RAMPERSAD. Industrial Relations officer (IRO) of the Trinidad and Tobago Unified Teachers Association (TTUTA) Justin De Freitas is contending that proper procedure was not followed in the removal of Sookoo Sonnylal, as principal of the beleaguered Siparia West Secondary. De Freitas said the union was at a loss to understand what act of indiscipline Sonnylal committed to have him removed from his place of work and a school supervisor put in charge. De Freitas who will be representing Sonnylal, said a meeting has been arranged for next Monday. Sonnylal’s removal from the school compound, revolves around an online video which shows him engaged in a confrontation with a group of students from the school, in which some disparaging comments were made. An earlier online video, in which a student was seen in an act of extortion and physical abuse on another student, has resulted in the suspension of four students and a criminal investigation by the police. Siparia police confirmed yesterday that no charges had been laid against the students. Education Minister Anthony Garcia asserted that Sonnylal had not been suspended and said that function resided with the TSC. He said there were certain breaches of discipline and the ministry had asked him to remove himself while an investigation was done by the school supervision unit. Reply to "TTUTA wants principal back on the job"